The underlying significance of a ball-playing holding midfielder has been highly recognized in modern day football. The elite sides around Europe all possess a player in this mold – the likes of Andrea Pirlo, Sergio Busquets and as of late Phillip Lahm have consistently performed at world-class levels as the single pivot, abolishing the belief that only players whom possess a physical presence can succeed in this role. Most recently, the admiration for a deep-lying midfielder has shifted towards the Premier League. Michael Carrick was a standout last season in a deeper role, similar to Mikel Arteta’s impressive showing the year prior. And while sides like Liverpool occasionally play with a midfield trio, they still combine energy (Henderson), passing (Gerrard), and strength (Lucas) in these areas. The aim to control central areas is pivotal in the modern game, which explains why teams prefer to sustain possession and have players that are capable of dictating the tempo from deep positions. Everton has undergone a radical transformation in terms of their philosophy, since Roberto Martinez’s arrival. Opposed to their reactive approach under David Moyes, Martinez has instilled a pragmatic possession-based philosophy. Despite losing Marouane Fellaini to Manchester United, Martinez has put his faith in Ross Barkley to be the main source of creativity, Romelu Lukaku to spearhead the attack and Kevin Mirallas as a direct wide threat – thus forming a tantalizing partnership on the right flank with Seamus Coleman. Nevertheless, Martinez inherited a great core of players, and the Spaniard has found a balance between promising technical youth, and experienced veterans. Surprisingly, Martinez’s most influential signing came at no cost, minutes before the transfer window closed. 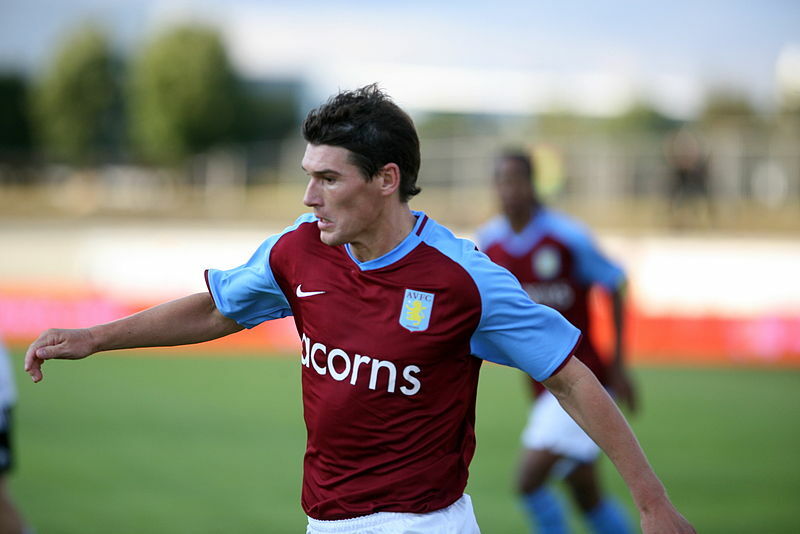 Gareth Barry was surplus to requirements at Manchester City, and in desperate need of first-team football, so a change in scenery was tempting – even if it wasn’t the dream move to Liverpool that he hoped for in 2008. Rafa Benitez was keen on bringing in Barry for Xabi Alonso – who was reportedly set to depart Anfield – but Liverpool didn’t have the funds to meet Villa’s price valuation, and Alonso stayed at the Merseyside club for another season. At the time, Barry’s growth was gaining recognition at Aston Villa, so when Manchester City inquired about his services in 2009, the Englishman couldn’t decline. “I feel I am joining a club that will seriously challenge to win major honours,” Barry said. However, while Barry’s stature continued to rise, his deficiencies were exposed on the world’s largest stage in South Africa. Barry was exhausted. He looked unfit, out of his element, average, frankly there weren’t enough words to describe Barry’s unpleasant afternoon at the Free State Stadium nearly four years ago. The English midfielder chased German shadows when Joachim Low’s men slaughtered England in the most recent World Cup. The Englishman conceded possession at the edge of the box, which led to Germany’s third goal – and he was lucidly beaten for pace by Mesut Ozil, thus putting the match out of reach. Barry’s career was scarred – he’s never fully recovered from that humid, summer day in Bloemfontein, and many began to closely critique his weaknesses afterwards. Despite enjoying two good seasons at Manchester City, Barry’s progress at the club level was impeded. In terms of silverware, the 32-year-old midfielder coveted an FA Cup and Premier League medal, but he was incapable of solidifying a role alongside Yaya Toure in City’s midfield. While the Englishman’s performances were rarely putrid, his natural ability wasn’t enough to boast the Manchester Club amongst Europe’s elite. And as the years went by, City desperately searched for players to fill this void. By the end of Barry’s fourth season with the club, City had Jack Rodwell, Toure, Javi Garcia, and newly acquired Fernandinho at their disposal. At the age of 32, Barry knew his minutes would be scarce when manager Manuel Pellegrini told him a starting role was unattainable, as many midfielders were ahead of him. Barry began to realize that a move abroad was logical, and with Marouane Fellaini set for a move to Manchester United, Everton’s interest persuaded the Englishman. “Firstly, it’s all about playing regular football in the Premier League. I haven’t joined Everton to try and help my England ambitions but that will come if I’m playing consistently well for Everton,” Barry said. The arrival of Barry has led to a formidable midfield partnership with James McCarthy – the Englishman often sits as the deepest midfielder, while McCarthy’s dynamism enables him to drive forward into attack. More importantly, Barry’s positional and tactical awareness allows Everton’s attacking players to express themselves. He drops between the centrebacks and in vacant spaces out wide, giving the fullbacks onus to surge forward. Barry sits in deep areas ahead of the two centrebacks, and focuses on dictating the tempo of the match – his passes often go sideways, but the Englishman isn’t wary of playing forward, penetrating balls. The 32-year-old averages 69.7 completed passes per game – a team high – at an 86% success rate, but he also plays an integral role on the defensive end breaking up play. More so, Everton hasn’t lost a match at full strength, with Barry in the starting XI. Martinez has expressed his praise for the midfielder on several occasions, as he believes English supporters don’t appreciate the importance of the no.6 role. “To be able to see a pass and execute it in the way he does is a talent which you either have or you haven’t but he has developed an incredible awareness – the way he sits in for other players, the way he drives forward when he has to, the way he takes decisions,” Martinez said. In the buildup to Gerard Deulofeu’s equalizer against Arsenal, we witnessed a glimpse of what Barry offers Everton. Barry controlled a loose ball, and played a forward pass to Ross Barkley, who turned Mathieu Flamini wonderfully, and evaded Arteta’s challenge. Barkley sprayed the ball out wide to Bryan Oviedo, and Barry continued his run powerful from midfield, aiming to create an overlap, which gave Oviedo half-a-yard to deliver a cross – thus leading to Deulofeu’s magnificent finish. Everton’s transformation under Martinez has been remarkable – The Spaniard’s ability to evolve their attack over a short period of time has produced a different side at Goodison Park. The young attacking players may steal the headlines, but Barry remains a key cog towards the club’s success this season. Bayern Munich decimated Manchester City at the Ethiad Stadium. Pep Guardiola made one change to the side that defeated Wolfsburg this weekend. Toni Kroos returned to partner Bastian Schweinsteiger in midfield, while Thomas Muller led the line in Bayern’s 4-1-4-1. Arjen Robben and Franck Ribery kept their spots on the flanks, while Phillip Lahm started as the sole holding midfielder. Manuel Pellegrini made four changes to his starting eleven that fell to Aston Villa on Saturday. Edin Dzeko led the line in Pellegrini’s 4-2-3-1, ahead of Sergio Aguero, Jesus Navas and Samir Nasri. Gael Clichy and Micah Richards returned to the City back four, while Yaya Toure and Fernandinho played in the double-pivot. Bayern produced a magnificent away performance, which saw Guardiola’s men press efficiently and dominate the midfield from the opening whistle. 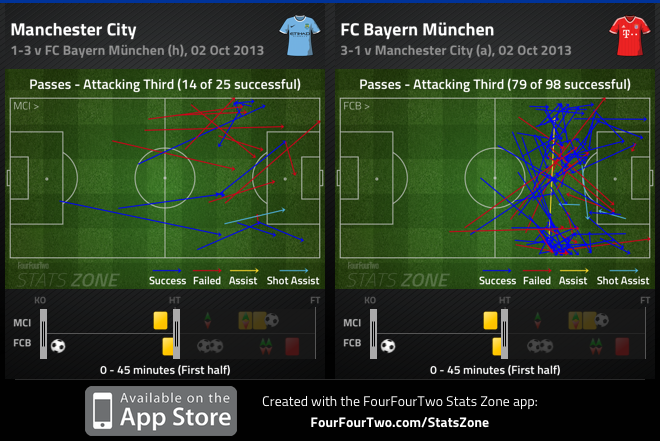 It was always going to be interesting to see how City coped with Bayern’s pressure. Guardiola’s men pegged City into their third of the pitch – getting numbers around the ball carrier, thus forcing Pellegrini’s men to concede possession. Frankly this pressure led to Bayern’s dominance, as City was unable to sustain possession for the entirety of the first half. 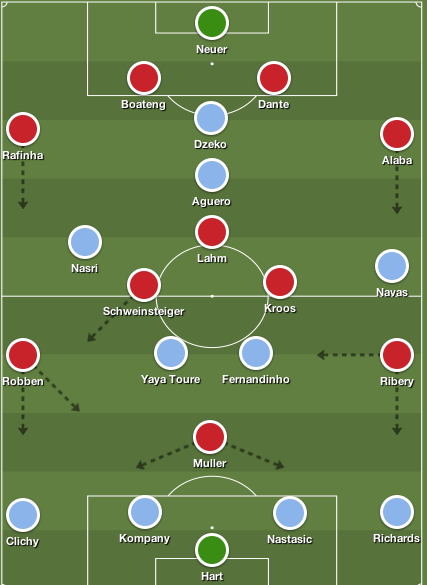 It all started with Robben and Ribery closing down the City fullbacks – Muller charged down the centre backs, Bayern’s fullbacks pressed City’s wingers, while the European champions had a distinct numerical advantage in midfield. Bayern repetitively won the ball in City’s third which led to the European champions dominance for majority of the match. With Bayern maintaining a large portion of possession, City’s aim to maintain a solid shape in midfield was logical. City dropped into a narrow 4-4-2 when Bayern was in possession and there were many factors in their shape that led to Bayern’s superiority. First off the duo of Navas and Richards were unable to cope with Alaba and Ribery’s attacking threat. The Frenchman constantly got the better of the Manchester City fullback, and Navas struggled to track Alaba, who was persistent on surging forward. The Bayern duo’s persistence to get forward led to Ribery’s opener, as Alaba’s overlapping run confused Navas and Richards, thus leading to Ribery cutting inside and unleashing a powerful shot from distance that slipped past Joe Hart at the near post. Yet, on the opposite side, Nasri played narrow attempting to maintain a compact shape, but this urged Guardiola’s men to penetrate on the right flank. Rafinha constantly scampered down the right side on several occasions attacking space and aiming to create overloads with Robben. Schweinsteiger also ventured over to the right side when Nasri protected Clichy to help Bayern overload the right flank. Clichy was an isolated figure at left back, and Guardiola instructed his men to penetrate the space available – and to no surprise, Bayern’s goals in the second half came down that flank. City’s shape without the ball was questionable – as Guardiola instructed his men to penetrate wide areas. Another key element in City’s shape was their numerical disadvantage in midfield. The Bayern trio of Schweinsteiger, Phillip Lahm and Kroos dominated Fernandinho and Yaya Toure for large portions of the match. Also, the intelligent movement of Robben, Ribery and Muller into central areas presented Bayern with several passing options in midfield. More so, Pellegrini’s idea to play two strikers was logical – due to Dzeko’s height and ability to hold up the ball, while Aguero’s pace to run behind defenders – but it allowed Guardiola’s men to dictate possession. Aguero wasn’t instructed to press Lahm – who was often the spare man in midfield – and the German international was allowed to control the tempo of the match. Each member of Bayern’s midfield trio had a pass completion rate over 90%, but it was Kroos who shined brightest. Kroos possesses a wonderful gift of finding pockets of space in midfield to receive the ball – frankly there aren’t many in the world better than him at doing this. And despite being pressed by Yaya Toure and Fernandinho, the German midfielder still managed to stamp his authority on the match – specifically in the final third. But despite Kroos’ positive impact going forward, he played a key role in Bayern’s high-press – relentlessly working hard to win the ball in City’s third. Kroos cleverly dispossessed Fernandinho in City’s third and played in Robben, who danced past Nemanja Nastasic and beat Hart at the near post. Furthermore, City’s shape without the ball allowed Bayern’s midfield to dictate the tempo of the match, as the numerical advantage in midfield allowed Guardiola’s trio to thrive. However, the most interesting talking point pre-match was the role of Muller. The German midfielder rarely receives the plaudits he deserves, but once again he performed exceptionally on a monumental European night. Muller closed down defenders efficiently and ran the channels superbly, aiming to find cracks in City’s high line – but his ability to win 50/50 challenges from direct balls was pivotal. Despite Bayern’s constant passing in central areas, the Bavarian’s did mix up their play, spraying a few long balls towards goal that Muller nodded down to his teammates. And Bayern’s winner stemmed off a similar play. Muller drifted to the right flank and made a run behind Clichy – who was caught ball-watching – controlling a well-weighed Dante long ball, and his second touch was magnificent, which guided the German past Hart to tap the ball into the net. Muller’s movement in the second half was great – he constantly rotated with both wide men, taking up their positions when they drifted centrally, and the City back line was unable to cope. Muller produced a mature performance as the lone striker – he allowed his teammates to get into better positions by linking play, provided them with forward passing options, his energy and will to close down defenders was vital, and he scored a great goal that highlighted his wonderful movement and tactical intelligence. Bayern continued to flex their muscle and out pass City in the second half and it was surprising to see Pellegrini stick with Dzeko and Aguero upfront. It was strange considering he had James Milner – a hardworking utility player – on the bench, while Javi Garcia was also available to add numbers in midfield. But Pellegrini stuck with his shape, and replaced Dzeko with Alvaro Negredo. Aguero began to stick closer to Lahm, but as the game wore on, the Argentine tired. David Silva and Milner then replaced Aguero and Nasri – and life was restored in the match when Jerome Boateng took down Yaya Toure who was clear on goal, thus resulting in a red card. City’s shift to a 4-2-3-1 did mount a positive end to the match – Negredo scored a well-taken goal as Bayern failed to press efficiently when they lost the ball, Milner began to trouble Rafinha, and Silva was lively in the final third after Boateng’s sending off. Zonalmarking.net editor, Michael Cox makes a great point on Bayern’s performance in the final 15 minutes of the match. 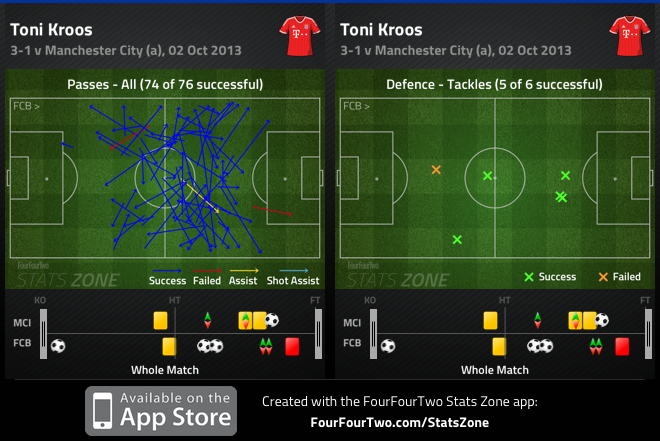 Guardiola’s men began to tire, resulting in a decline in their pressing. Like the game at the Emirates in 2010 – when Guardiola was Barcelona manager – Arsene Wenger’s substitutions were pivotal to their monumental win, as Barcelona’s energy levels dipped after pressing for majority of the match. This, along with Bayern’s tie against Freiburg – earlier this year – are examples of Guardiola sides fading after pressing for large portions of the match, leaving them likely to concede in in the final quarter of matches. It’s an issue the Spaniard will need to sort out, as Heynckes was able to find a balance between pressing and an organized shape – whether he decides to do so will be pivotal in the latter stages of this competition. Bayern continued to dominate for majority of the second half, yet Pellegrini’s changes did harm the European champions in the final minutes of the match. 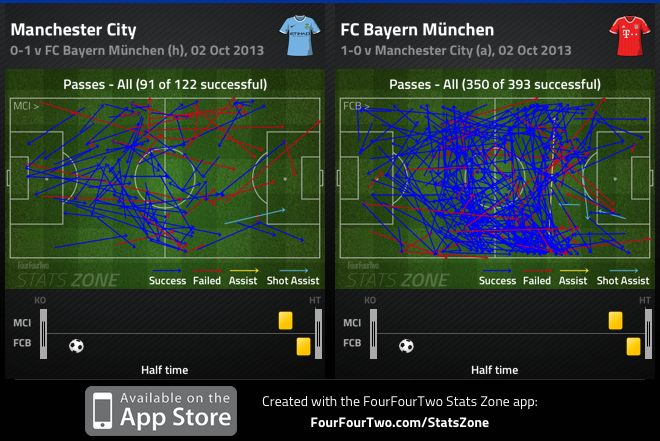 Bayern Munich blitzed City for majority of the match, yet Pellegrini’s approach needs to be questioned. Pellegrini’s decision to play with two strikers wasn’t absurd, but his inability to alter the problematic issue was irrational. The Chilean failed to change his sides shape or add numbers in midfield – as Bayern’s midfield and constant pressing, pegged City in their third for large portions of the match. “We pressured them well when we weren’t in possession and thus forced City to play long balls, which we were able to win. We moved the ball around well. Ever since Philipp Lahm started playing further up the pitch, we have started to create more chances,” Guardiola said. “We now need to show the same presence and dominance in the return game, but until then we won’t stop working hard and trying to improve,” he said. Guardiola’s men were superb on the night, and we’re beginning to see his philosophy reap rewards, as they produced one of the better European away performances we’ve seen in sometime.